I, II) Bisphaerocephalina (?) sp. 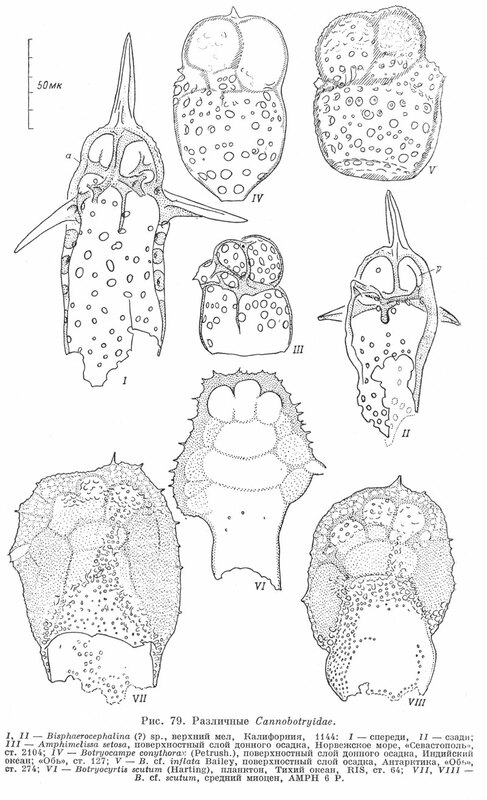 Upper Cretaceous, California, 1144: (I, anteriorly; II, posteriorly); III) Amphimelissa setosa, surface layer of the bottom sediment, Norwegian Sea, “Sevastopol” station 2104; IV) Botryocampe conythorax (Petrush. ), surface layer of the bottom sediment, Indian Ocean; “Obj”, station 127; V) B. cf. inflata Bailey, surface layer of the sediment, Antarctic, “Obj”, station 274; VI) Botryocyrtis scutum (Harting), plankton, Pacific Ocean, RIS station 64; VII, VIII) B. cf. scutum, Middle Miocene, AMPH 6P.